Vascular surgery is the set of procedures and treatments that deals with the circulatory, focusing on veins and arteries. The vascular or circulatory system is key to overall health. It keeps blood circulating properly and works with other systems and organs to keep tissue healthy. It can make a large impact on quality of life when blood cannot circulate efficiently. Our vascular surgeons have years of refined skill to correct vein and artery conditions. 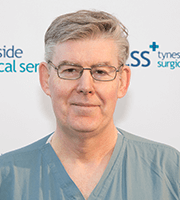 The vascular surgery team at Tyneside Surgical Services specialises in the treatment of varicose veins, using radiofrequency ablation to treat this condition. Varicose veins are common and generally don’t need treatment, but may need to be treated if they are causing pain or discomfort, or complicates arise. Varicose veins happen when valves in the vascular system weaken, allowing the blood to flow backwards into the vein and pool. This causes the vein to swell and enlarge and this results in varicose veins. Radiofrequency ablation is a minimally invasive procedure that is conducted under local anaesthetic. It is conducted by creating an incision above or below the knee. Radiofrequency energy (radio waves) is then used to heat the vein until the vein wall collapses. This seals the varicose vein shut, causing the blood to be diverted and flow to a healthy vein instead.